The dart fitted bolero may have long or three quarter length sleeves. 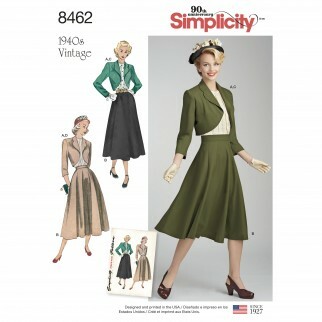 A shaped collar and revers are cut in one with the bolero and lining is optional. The full circular skirt joins to a waistband. Outside, tucks enhance the contrasting, back buttoning blouse, which features a high neckline and extended shoulders. Vintage Simplicity sewing pattern.